Hammerheart Records, double black vinyl, The wait is over! The new studio album ?The Gospel? 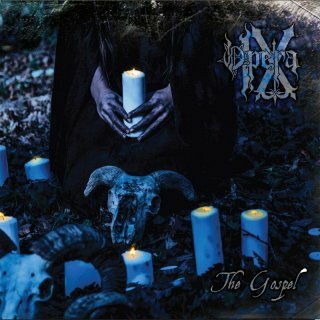 by the legendary Opera IX is finally released after six long years by the previous album ?Strix - Maledictae in Aeternum?. ? ?The Gospel? is a concept album focused on the Italian myth of ?Aradia And The Gospel Of The Witches?, written by Charles Godfrey Leland and containing what he believed was the religious text of a group of pagan witches in Tuscany, Italy, documenting their beliefs and rituals. The album includes nine masterfully composed tracks with sounds that represent a bit of a ?return to the past? in terms of dark, mystical and occult atmospheres and sees the inclusion of a new witch on vocals (Dipsas Dianaria) that forges with its powerful and ritual voice every track keeping intact the Opera IX trademark in years. Far from the more bombastic sounds we often find in the symphonic genres today, ?The Gospel? ?s synth and operatic elements are respectfully understated, and we appreciate the largely scaled back approach.